Buenos días from Cozumel. 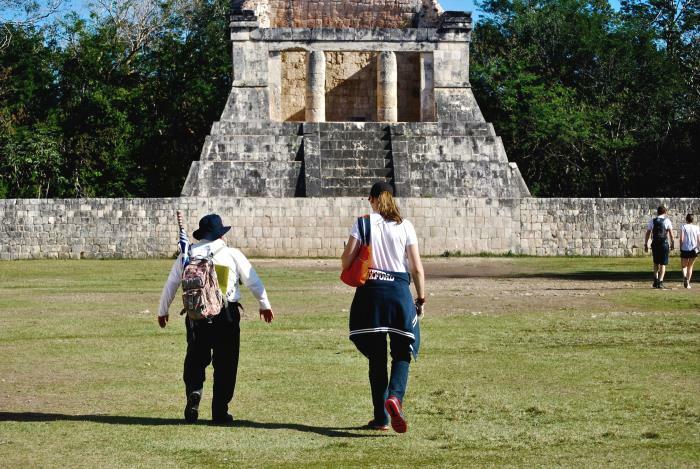 Recently Adrianna Deacon de Hernández and her son flew with us to Chichen Itza. And in her own way she wrote about here experience traveling to the archeological site by Airplane. You could call it a Review. I would say it´s great start of a novel, jeje. 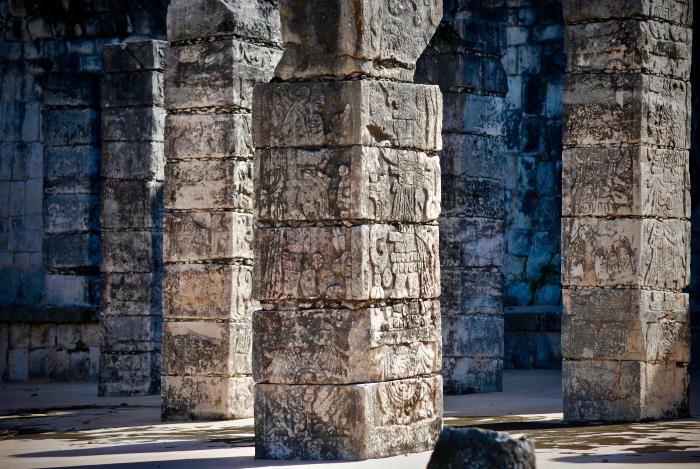 “Walking in to the Cozumel airport’s General Aviation entrance, I spot Leo immediately. The owner of Fly Cozumel stepping forward to greet my son and I with a broad smile and a hand shake. 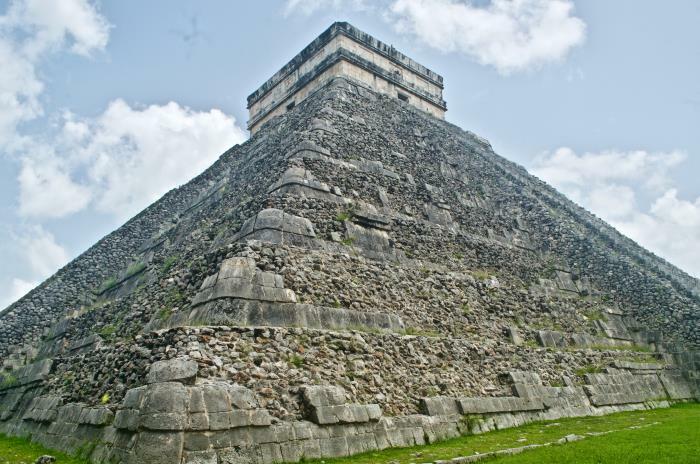 Leo and the operational manager Fernanda were just finishing up with the required flight paperwork before we could leave on our trip to see Mexico’s contribution to the official “New Seven Wonders of the World” and UNESCO World Heritage site – Chichen Itza. My son has never flown on a small Airplane and had been up since 3am, I suspect a big reason was excitement about our morning trip. 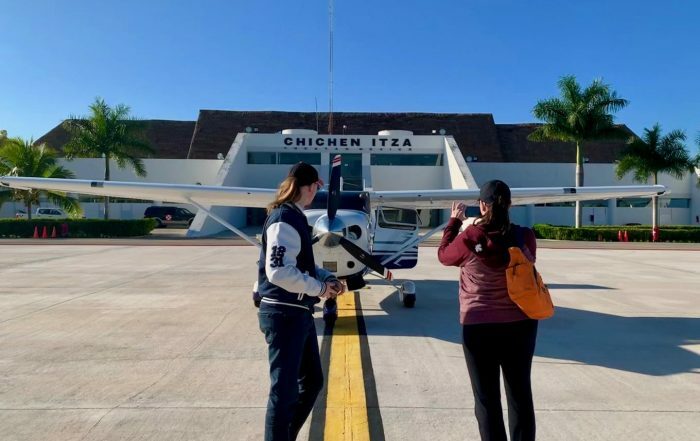 After an introduction to our pilot for the day (Abraham) and a quick security check, we headed back outside, into the cool morning air on the Cozumel tarmac. Our ride and Leo’s newest Airplane, a shiny-new 2018 Cessna 206, complete with state of the art Garmin GPS / automatic pilot, air conditioning, nice headsets, comfortable seats and that “new-Airplane-smell.” I was surprised at the amount of seating room inside. I’m just shy of 6ft and my 6’2” teenager and I were both able to sit comfortably inside, which is a bonus for any trip over 10 minutes! With the final checks in order, our headsets on and approval to leave, Abraham started up the Airplane. The cold engine sputtering first, then suddenly roaring to life. 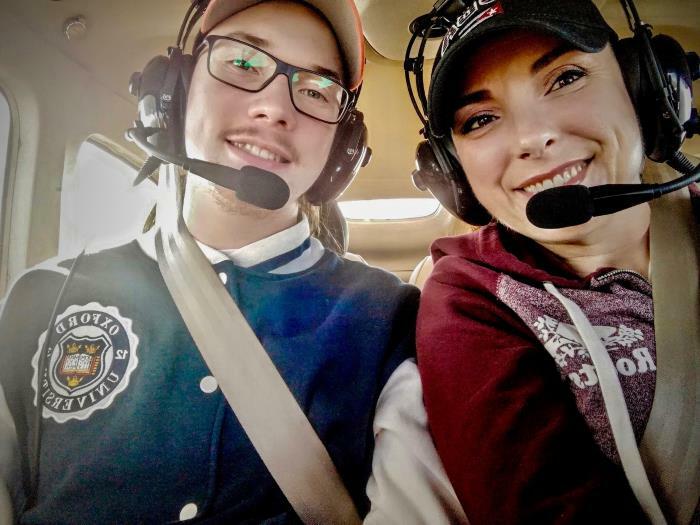 I haven’t been in a small Airplane since I was a young child and my grandfather first took me up into the skies, so I really wasn’t sure what to expect from this flight. However rolling down the tarmac, my excitement was growing and I was looking forward to the view I would soon be enjoying. I could feel the powerful engine tugging at the plane, eager to propel it forward. Lifting up through the air over Cozumel, it’s surprising to see how the town of San Miguel is so deliberately carved out from the jungle. 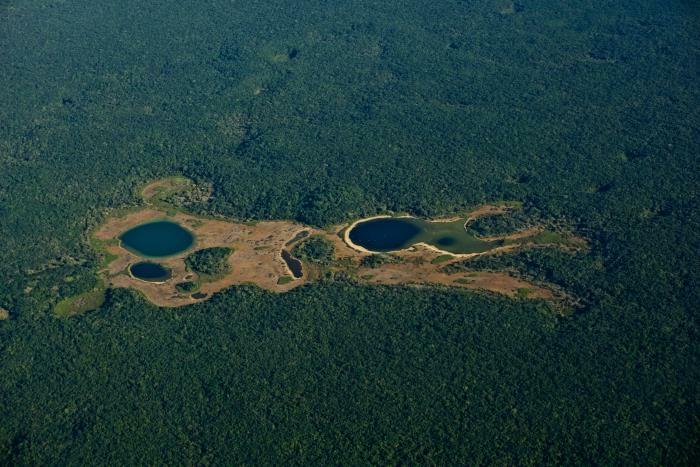 When you’re on the ground and living in the midst of it, it’s easy to forget how thick the jungle is and how completely it blankets the island in it’s thick, compacted mass of green. Except for town and some straggling residences, the island is solid jungle. Small niches cut neatly into it for us to exist and when you’re flying over with a birds-eye view, you realize the town of San Miguel is actually a very small part of it. 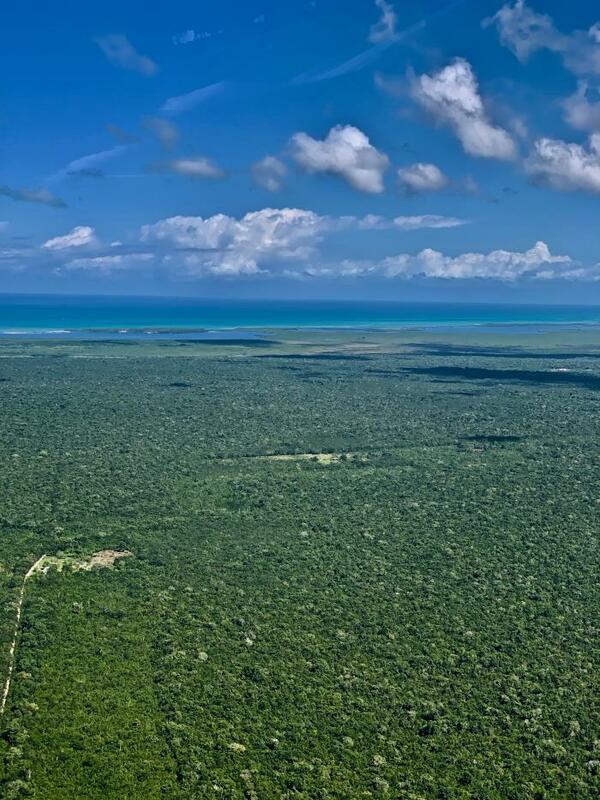 Nearing the Mexican Caribbean sea, the diverse shades of blue which rim the island, slowly become more apparent. The colors tourists and travelers dream of on snowy days and photographers hope to capture, in all their magnificence. Incredible shades of turquoise, broken by triangular waves of white wake, trailing behind dive boats. Like small, white water bugs as they make their way to the various, popular dive spots on the west side of the island. From the Airplane, I can also see the wall, where the shelf of the island drops off into incredible depths and the deep, deep blue. There simply is no other way to see this beauty, only by air can you truly get to see the full scope of it. 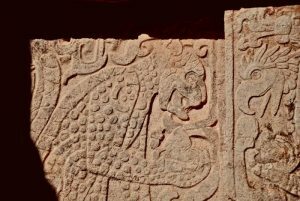 Adrianna continues her Review with the arrival in Yucatan. 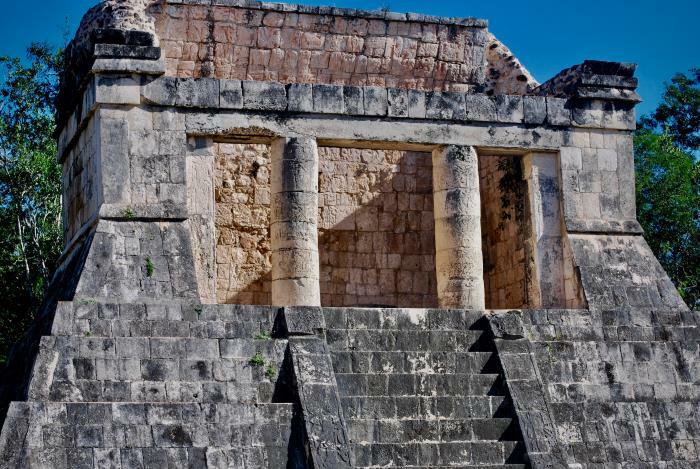 “Upon arrival at the Chichen Itza airport, we were welcomed by crew and staff. We were the only people there at the time, so it was a quick pass-through and out to our waiting taxi. Leo introduced us to our driver (Miguel) and explained we were just a 10 minute ride from the ancient city. Driving through Pisté on our way to the site, my son and I made note of how different it looked from what we see daily in Cozumel. Arriving at Chichen Itza, Leo walked us up the stairs and gave us our tickets before meeting and introducing us to our guide Jorge, known widely as Tortuga. With his bucket hat and glasses, Tortuga’s like a jolly…rounder version of Gilligan. 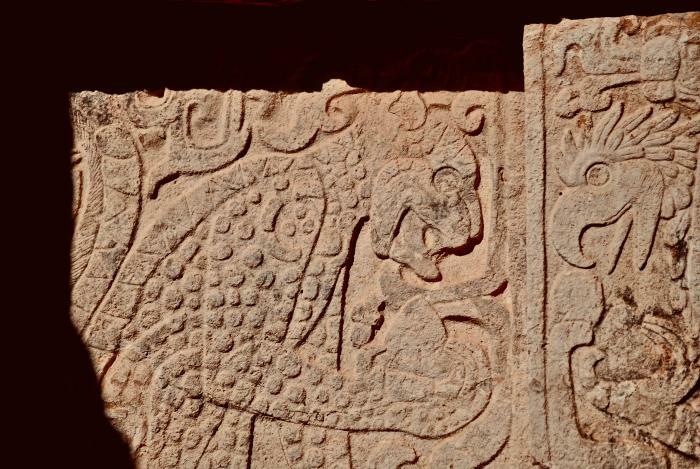 A humorous fellow, full of enthusiasm and knowledge of the ancient Mayan city, he wasted no time at all in starting to describe what the area had looked like back then as well as where, why, and how things had changed and were different from what we were seeing now. Taking care to find us a spot out of the direct sun, Tortuga pulled out a book with photos of artifacts as well as artist drawings made from when Chichen Itza was re-discovered. I had no idea it had been in such a sad state from trees that had grown up – and into it. After learning that, the restoration is that much more amazing. As we stood and listened to Tortuga, able to see “El Castillo” in the rising day sun, it was hard not to feel the historical weight of it all. The pyramid is pretty magnificent, certainly unlike anything I’ve ever seen in person and to imagine it as the hub of this once bustling, ancient city was impressive. We spent a couple hours this way, learning from Tortuga, soaking it all in and taking a zillion photographs. By the time we were ready to leave, the bus throngs had begun to arrive. En masse. I’m not crazy about crowds, it’s not a phobia or anything, I just find it irritating when you want to experience something and cannot even get a photo because 800 other people are jumping in to do one as well. 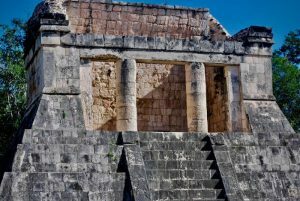 The benefits of flying to Chichen Itzá and arriving at 9:30am were obvious in the fact it was a little over an hour trip total to get there vs. 4 hours – but then seeing the pile of people flowing in, when we were already finished and leaving?